This homemade angel food cake is light, airy, and tastes like a slice of summer. It bakes up wonderfully high, and is much easier to make than you might think! Serve it with fresh whipped cream, berries, ice cream, or eat it simply on its own (my favorite way! ); this is a fantastic dessert for any spring or summer birthdays, picnics, or special occasions. Welcome to the April Bake-Along! We are celebrating the beginning of spring with one of my very favorite summer desserts, and one that might be perfect for your Easter festivities this month! 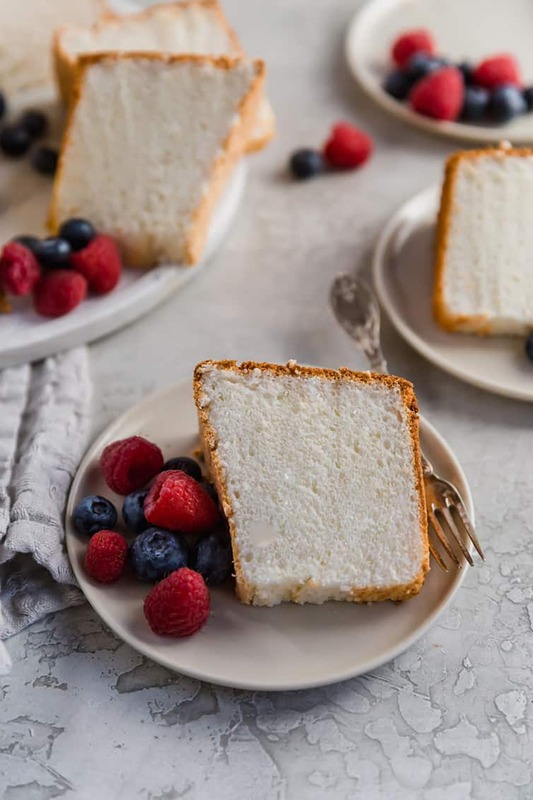 For as much of a chocoholic as I am today, angel food cake was one of my all-time favorite desserts when I was growing up. As far as I can remember, no one in my family made them from scratch, but they were a Sunday staple at my grandma’s house during the summer. I always enjoyed a big slice of angel food cake, lots of sliced fresh strawberries and a big dollop of Cool Whip to cap off my Sunday dinner. Angel food cake is one of those store-bought favorites that I had been wanting to make from scratch for a long time. I did for the first time about eight years ago, and it was good, but I thought it could be better. I made a few tweaks and arrived at this absolutely phenomenal angel food cake recipe. Spoiler alert: It’s not nearly as difficult as you might think, and it’s so, so much more delicious than store-bought! 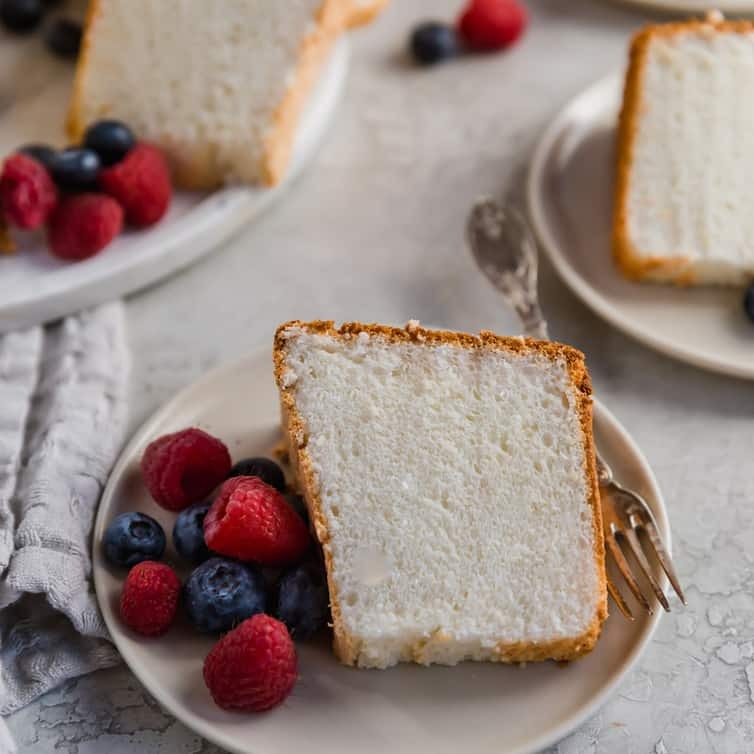 Angel food cake is made with only six ingredients (and you may have all of them in your pantry right now!). Cake Flour: We use cake flour instead of all-purpose flour because it has a lower protein content and will ensure a soft and tender crumb. 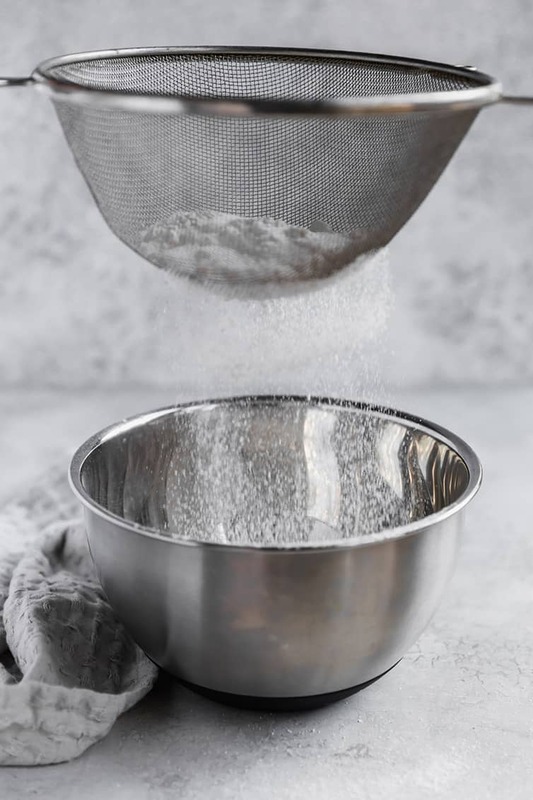 Granulated Sugar: To sweeten the cake! Salt: Balances out the sweet and brings out all the wonderful flavors. Egg Whites: The star of the show! Angel food cake relies upon egg whites for all of its leavening. Using only whites (no yolks) gives this cake its super light texture. Cream of Tartar: This helps to stabilize the egg whites and keep them from deflating. Vanilla Extract: Delicious flavor! See the notes below for other flavor options. There are only a few steps standing between you and a phenomenal angel food cake! Sift, sift, sift! You are going to sift together the cake flour, some of the sugar, and the salt five times. Yes, FIVE TIMES… that’s not a typo. This creates a super fine combination of dry ingredients that will be readily absorbed into the egg white mixture and not weigh it down while the cake bakes. Beat the egg whites to stiff peaks: The hallmark of the angel food cake! 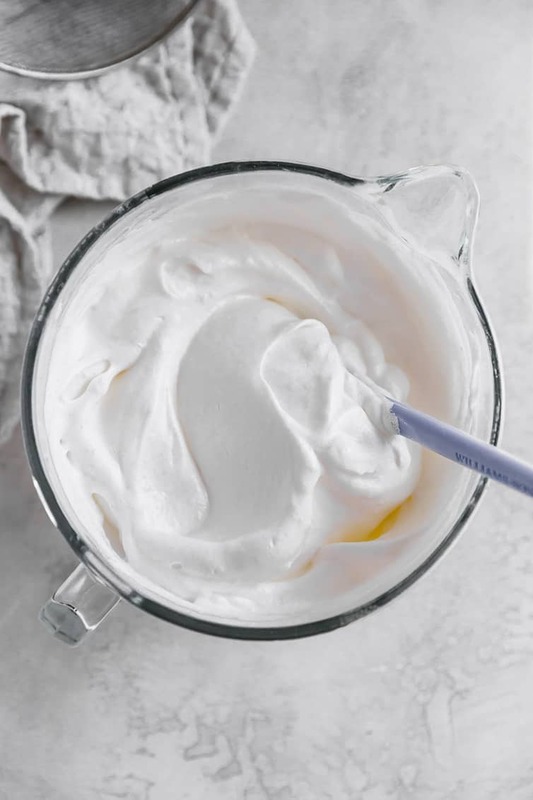 You will beat the egg whites until frothy, then add the cream of tartar and vanilla extract (or whatever flavoring you are using), then increase the speed and gradually add the rest of the sugar, continuing to beat until the egg whites have transformed into stiff, glossy peaks. Fold in the flour mixture: More sifting! 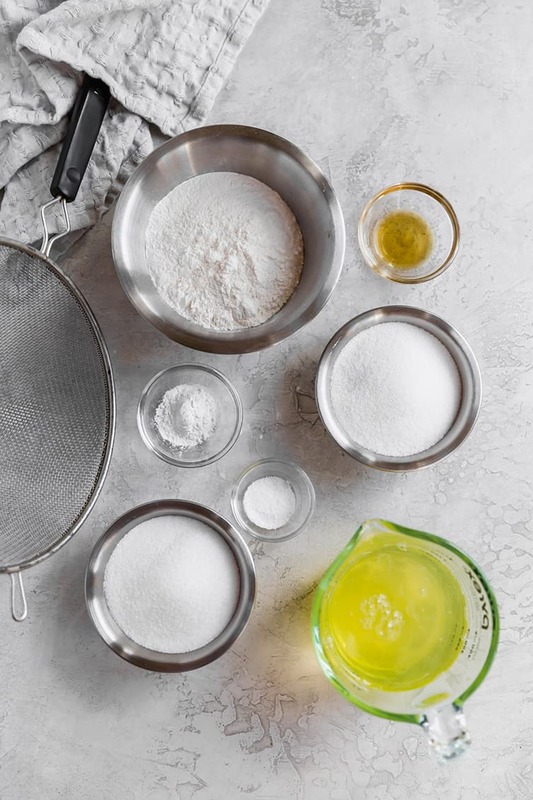 You will sift about 1/4 cup of the flour mixture at a time over the egg whites and ever-so-gently fold it in, which will keep the egg whites from deflating. Transfer the batter to the tube pan: Spoon the cake batter into the pan (remember – do NOT grease the pan!) and run a butter knife through the batter to clear any air bubbles. Bake: The cake is baked at 350 degrees until a skewer comes out clean, about 35 to 40 minutes. Cool upside-down: Perhaps the most important part! Cooling the cake completely upside-down allows the cake to continue its climb up (now down) the walls of the pan and maintain that amazing volume and height! Do You Have to Use a Tube Pan to Make Angel Food Cake? A tube pan is a specialty pan that is used for angel food cakes and chiffon cakes. The tall sides and inner tube allow the cake to “climb” the pan and cling to the sides while it bakes (which is why you never grease these pans!). Perhaps even more important, however, is the “feet” you see on a tube pan; these allow the cakes to cool upside down without the top of the cake touching the counter or a cooling rack (if your pan does not have feet, you will invert the center onto the neck of a bottle to suspend it upside down during cooling). This is vital in ensuring that the cakes maintain their volume and do not collapse. Baking an angel food cake in a traditional cake pan or Bundt pan will unfortunately not work; the cake will fall. What is the Difference Between Angel Food Cake, Sponge Cake and Chiffon Cake? A ton of notes to ensure your angel food cake is the BEST EVER! Eggs separate easier when they are cold, and if there is any yolk in with the egg whites, it will prevent them from whipping up into stiff peaks, so I recommend separating and measuring the eggs while cold, then allow them to come to room temperature before proceeding with the recipe. How many eggs you use will vary based on the size of the egg and the size of the yolk in each individual egg. I typically only need 10 eggs to get 1½ cups of egg whites, but most recipes say 11 or 12 is the average. You can substitute almond extract, orange extract, lemon extract, or use them in combination with the vanilla to adjust the flavoring. Be sure to check the label on them, however; if there is any oil (which is sometimes included in flavored extracts) it can prevent the eggs from forming stiff peaks. 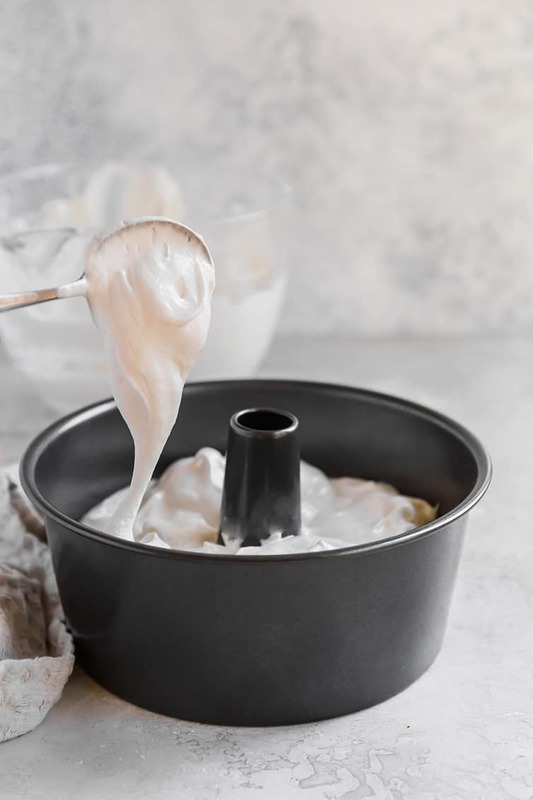 While the mixing is easiest with a stand mixer using a whisk attachment or a hand mixer, you can whisk the egg whites by hand using a balloon whisk and elbow grease! A tub pan is essential for this recipe; you want one that has a 16-cup capacity – this is the one I use. Very important – DO NOT GREASE THE PAN. The cake needs to cling to the sides of the pan in order to rise, as well as during the cooling process. This ensures that the angel food cake will be high and retain its volume. If your tube pan does not have a removable bottom, then line the bottom only with parchment paper for an easier release. If the pan has little feet on the bottom, you can simply set it upside down to cool on a wire rack. However, if it does not have feet, then you will want to invert the pan onto the neck of a glass bottle for the cooling process. It’s super important that when cutting angel food cake, you use a sharp, serrated knife and a gentle sawing motion (I use my favorite bread knife). Using a straight-edge knife and/or cutting straight down will smoosh the cake. Serving Suggestions: Fresh berries, whipped cream, and /or chocolate ganache are all wonderful accompaniments! MAKE-AHEAD – Angel food cake can be prepared one day in advance; once cooled completely and removed from the tube pan, cover with plastic wrap and keep at room temperature. FREEZER INSTRUCTIONS – Angel food cake can be frozen by wrapping it (either the whole cake or individual slices) tightly in plastic wrap, then in aluminum foil. Place in a freezer-safe bag or container and freeze for up to 4 months. Thaw at room temperature. Bake the angel food cake! Check in on Instagram and Facebook throughout the month to see everyone’s angel food cake! 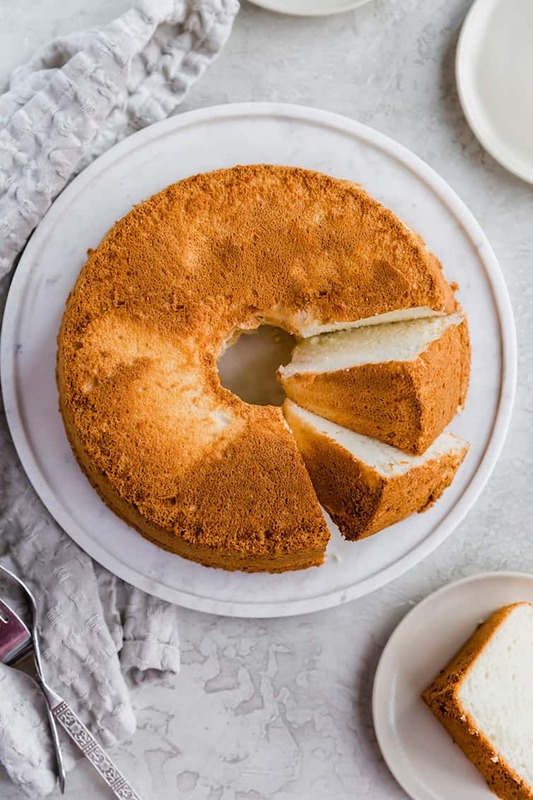 This is such a lovely cake – light and spongy, with just a hint of vanilla flavor, just like the angel food cakes that I remember from when I was a kid. If you love this angel food cake, give these lighter desserts a try. They are all perfect for spring and summer holidays and special occasions! This homemade angel food cake is light, airy, and tastes like a slice of summer. It bakes up wonderfully high, and is much easier to make than you might think! Preheat oven to 350 degrees F. Have an ungreased 16-cup tube pan ready. Sift half of sugar with flour and salt. Repeat 5 times. Beat egg whites on low until frothy, then add vanilla extract and cream of tartar. Increase to medium, adding remaining sugar 1 tablespoon at a time. Increase to medium-high and beat until stiff, glossy peaks, scraping sides and bottom of bowl once or twice as needed. Sift about ¼ cup flour mixture on top and fold gently to incorporate; repeat until all flour is used. Spoon into tube pan, smooth the top, then run a knife through batter to break any air bubbles. Bake until skewer inserted halfway between edge and center comes out clean, about 35 to 40 minutes. Cool upside down at least 1 hour. Run knife around edge and turn out onto serving dish; run knife around bottom and release. Place on a serving platter, slice and serve. 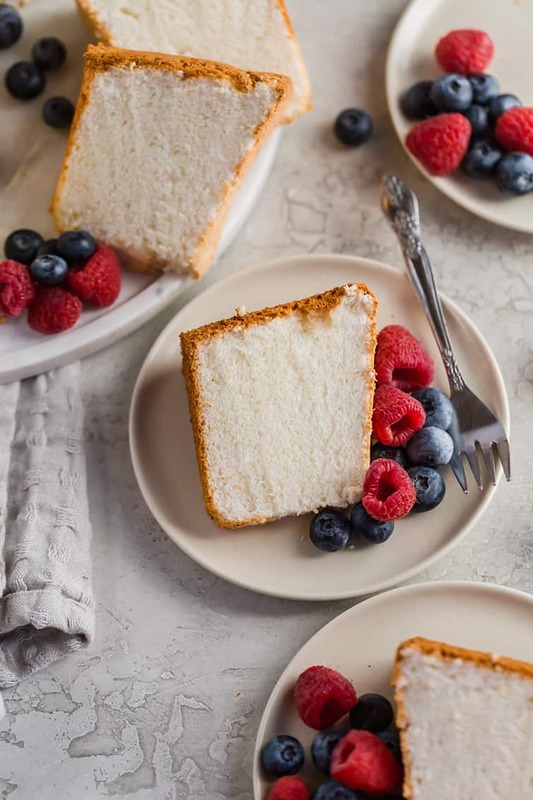 Angel food cake is best the day it is made, but can be stored for up to 2 days at room temperature, wrapped well in plastic wrap or stored in an airtight container. A tub pan is essential for this recipe; you want one that has a 16-cup capacity - this is the one I use. Very important - DO NOT GREASE THE PAN. The cake needs to cling to the sides of the pan in order to rise, as well as during the cooling process. This ensures that the angel food cake will be high and retain its volume. If your tube pan does not have a removable bottom, then line the bottom only with parchment paper for an easier release. It’s super important that when cutting angel food cake, you use a sharp, serrated knife and a gentle sawing motion (I use my favorite bread knife). Using a straight-edge knife and/or cutting straight down will smush the cake. Serving Suggestions - Fresh berries, whipped cream, and /or chocolate ganache are all wonderful accompaniments! MAKE-AHEAD - Angel food cake can be prepared one day in advance; once cooled completely and removed from the tube pan, cover with plastic wrap and keep at room temperature. FREEZER INSTRUCTIONS - Angel food cake can be frozen by wrapping it (either the whole cake or individual slices) tightly in plastic wrap, then in aluminum foil. Place in a freezer-safe bag or container and freeze for up to 4 months. Thaw at room temperature. 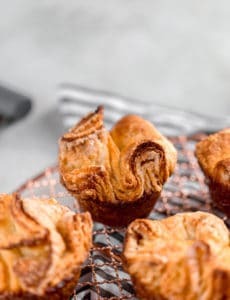 Update Notes: This recipe was originally published in June 2011 and updated in April 2019 with a new and improved recipe, new photos, a video and extensive recipe tips. Can I use confectioners sugar in the angel food cake? Could I use caster sugar instead of granulated sugar? This is just awesome cake, Some of our Bakery’s Ladies customers were looking for same kind of light spongy cake on their Kitty Party occasion, and i must thank you because every one loved this cake and appreciated.Thanks for Sharing. This is the first angel food cake I have ever made. Was fairly simple and it was so delicious! Was just reading your Grandma’s Fried Dough Recipe. My Mother made these or something very similar. If I recall correctly, she cut a hole in the middle of the strip and pulled one end of the dough through that hole, making a bow tie shape. I do not know if that alone made the shape or if after the dough was cut into strips she cut the ends on the diagonal. Hopes this helps. Your post made me think of my Mom who has been gone 20 years. She always made home made Angel Food Cake for our birthdays. She would frost it with the best homemade Butter Cream Frosting. Aww, you are so welcome, xo. I am so excited to try this! My mom has had an angel food cake for every birthday except one. When my grandmother passed away I became the angel food cake maker for her birthday. Even though I’ve done from scratch, I usually rely on a box. I will be making this in May for her birthday! I always add a 7 minute frosting to it as well, and tint it very light pink. LOVE the addition of 7 minute frosting – totally making that next time! My mom wasn’t much of a baker, but angel food cake was her specialty. I haven’t made one for at least 10 years, but it isn’t that difficult. Like a lot of other things, it’s a matter of right ingredients and right equipment. Mom made a chocolate angel food cake by adding 1/4 cup cocoa powder. You could also add a little instant espresso powder to deepen that flavor. Love the chocolate spin, I will have to try that! Thoughts on a carton of egg whites vs separating them??? Also, which whip cream recipe would you suggest? I notice you have a few variations with your recipes. Thank you! Hi Carolyn, I’ve never used carton egg whites, so I couldn’t say how they would hold up in this recipe. If you’ve used them before without an issue they should be okay. Thanks Michelle….a couple more questions….thoughts on making the cake a day ahead and any suggestions for soaked berries to top it? I would like to do in wine but am open to any thoughts. Hi Carolyn, You could certainly make this a day ahead and soaked berries would be delicious! Awesome…thank you…any tips on soaking the berries? Recipe? Wine…sugar???? Oh…but the whipped cream should be the day of right…I shouldn’t do that ahead or can I? Just a follow-up for anyone who wants to make this….it turned out AWESOME…the family loved it! Great light dessert for the spring/summer! Thank you, Michelle! Alright, angel food cake had been my favorite as a child. growing up nothing was better than coming home from the grocery store with a cake and strawberries to top it with. I don’t remember the last time I had any angel food cake but it is most like in excess of 10 years. I took this recipe and split it out into cupcakes and topped it with the strawberry meringue buttercream icing from another recipe on here. I wasn’t the most impressed with the icing but the cake is bloody amazing. I’m trying to not eat it all, tonight. thank you again for another great recipe. I made this to use for the Red, White and Blue Berry Trifle. I almost went with store-bought but I’m really glad I didn’t. My son got the leftover pieces and devoured them:) I hadn’t had Angel Food cake in at least 5 years. I forgot how good it is. What a great way to use up the egg whites in my freezer! And fun to make too! I happened to have a dozen egg whites in the freezer (leftover from making a couple batches of ice cream). This cake is now in my oven. Gorgeous cake! I can’t wait to try it…it’ll be perfect with some fresh strawberries or blueberries, mmm. I just made the “cook’s country” version of this cake tonight…also my first. The hardest part for me was…well the whole thing made me very nervous. i didn’t have cake flour so i did a LOT of processing and sifting. The cake is now cooling on a root bear bottle. Angel Food cake is one of those dishes I’d also like to make from scratch. Your recipe looks simple and delicious. I should try this for the Fourth of July! Wouldn’t it be pretty with blueberries and strawberries? Yum! I love angel food cake! But I have no room for another baking pan. I wish you could make this in a bundt cake pan… LOL has anyone tried? Yes I have tried in a bundt pan! I had trouble with my egg whites peaking, so my cake did not fully bake. I got the cake out of the bundt pan in one piece, but I’m not sure if this because it was more moist due to being under baked. You can see what I mean here — http://raisinquestions.wordpress.com/2011/04/26/how-come-my-guardian-angels-didnt-show-up-for-angel-food-cake/. 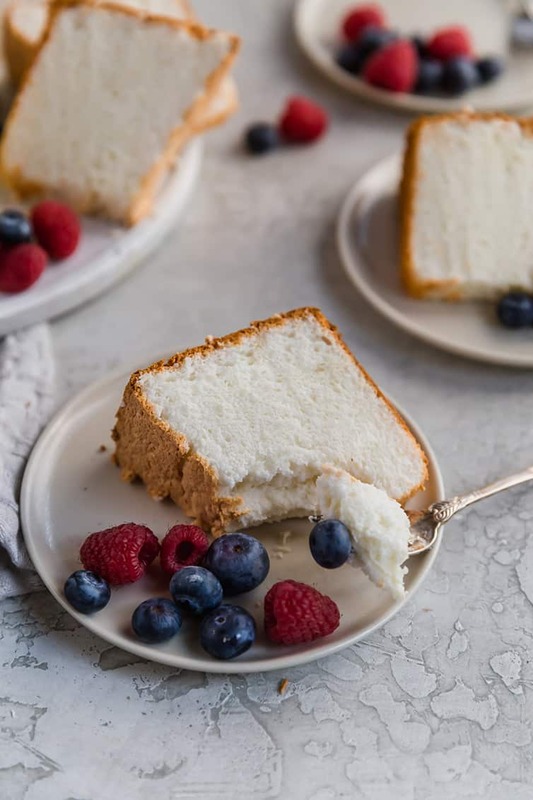 Michelle, I was laughing when I read your post, because when I recently blogged about my Angel Food Cake experience, it was all about how DIFFICULT it was! I didn’t have the right pan, or cream of tartar, or enough eggs, or a sifter, or an electric mixer… I couldn’t get the egg whites to peak and I was pretty freaked about not being able to get it out of the pan! But I think after reflecting on your post, Angel Food Cake really must be easy for experienced bakers — you just need the right tools, and maybe a little confidence. I’m still gaining that experience, but hopefully one day I will believe that Angel Food Cake is easy! Angel food cake always just tastes like summer to me. My friend’s Mom used to make it all the time and I have great memories of enjoying a nice summer breeze along with my slice of cake. Love it. Want it. Have to make it now.